In a previous post, How To Integrate Arduino With Unity, we have shown how data can be sent and received through the serial port. The main problem encountered was dealing with the latency and the delays that communicating across different devices introduces. The solution proposed in that tutorial used a coroutine; decoupling the device communication from the game logic attenuates the problem, but it doesn’t remove it. The main problem is that, despite the name, Unity coroutines are not really executed in parallel with the rest of the game. Unity, by design, is not thread safe. This means that true parallelism is intentionally avoided by the engine, as it could result in race conditions. To solve the problem of the communication between Unity and Arduino, once and for all, we need actual threads. C# supports threads with its System.Threading library. When a new thread is created, a function has to be provided. In the following example, that function is called ThreadLoop . When ready, the thread invoked a callback function that the MonoBehavior has provided. 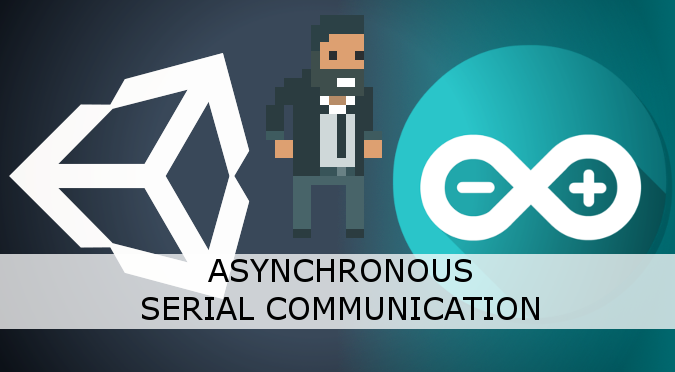 This was exactly the approach used in How To Integrate Arduino With Unity, implemented in the coroutine AsynchronousReadFromArduino. That approach, unfortunately, won’t work with threads. The thread that communicates with Arduino can complete its request at any moment in time. As a result, its callback could potentially be executed in an environment that is not thread safe. To make it simple: Unity objects cannot be touched or manipulated in a thread. The solution revolves around the concept of synchronised queues. When a MonoBehavior script wants to send a request to Arduino, it places it in a input queue. The thread reads it, executes it and when its done it places it into an output queue. The thread never accesses any Unity objects. Those two queues are used to safely send and receive messages across threads. Please note that the class Queue, by itself, is not guaranteed to be thread safe. The Queue.Synchronzed wrapper makes an existing queue thread safe (MSDN). Please, note that now that we are using queues, it is your script’s responsibility to periodically query the queue for incoming messages. Note that the functions WriteToArduino and ReadFromArduino are taken from the first part of this tutorial, How To Integrate Arduino With Unity. The code shown so far is not very reliable, as it doesn’t take into account possible errors and exceptions. A better implementation should always make sure that all the possible exceptions are captures and properly handled. Another aspect that has not been considered is the closure of the serial port. There are several approaches that can be done, but they all need a way for a Unity script to alter the state of a thread. For instance, by adding a boolean variable called looping that can be used a guard for the thread loop. The keyword lock ensures that no two threads can edit the object at the same time. This is who thread safe code is developed in C#. But it can also be the start of an endless stream of drama called deadlocks. The method StopThread can now be invoked safely from any Unity script. This post extends the original tutorial on Arduino and Unity. It shows how a thread can be used to avoid delays when waiting for data on the serial port. This post was inspired by Daniel Wilches’ asset SerialCommUnity. Although I probably never need to do these stuff, I really enjoy the article. It great to see an article that doesn’t just touch the surface of a concept, create a working duct-taped prototype and call it a day, which is basically every Unity tutorial. Unfortunately you can’t send any data back to Arduino, which is why I have decided to take a different approach. I enjoyed this tutorial very much, I hope you continue with this series. Keep up the good work! Hey! I think is a good practice to lock your resources in general. This example was very simple, but if you are going to perform a much complex operation, then you know what you have to do. 1. I notice that the the serial port is constantly opened and closed inside the ThreadLoop () in your example. If I have only one thread to deal the communication between Unity and Arduino, can I just move the stream.open() to be inside the Start() to execute it once, and close the stream inside the update() loop or OnApplicationQuit() once the game is ended? 2. Once I have two serial ports, say com1, and com2, to read data from 2 Arduino, Should I have two threads: one to deals with com1 the other one deals with com2? or I can use only one thread with 2 separating receiving and 2 sending queues(inQueue1 inputQueue2, outputQueue1 outputQueue2), and one locking variable (looping) so that I can query com1 first and following by query com2 in each iteration of ThreadLoop ()? (1) The thread is started ONCE. So, the serial port is opened only once (i.e. when the thread starts). You can see that the reading / writing bit is stuck in an endless loop. The opening part is not repeated. (2) This all depends on how critical your application is. Theoretically speaking, you can avoid threads all together if you don’t need super fast reaction times. The problem with merging two threads is that is harder to handle errors. Because you now have 4 possible states between the two working/non working threads. Hi Alan, thanks very much for this tutorial. I was just constantly dumping data into the serial buffer before and this approach makes much more sense to me. I came across some weird behavior in my Unity implementation and I wondered if you had any advice or insight. When using ReadLine(), everything works fine, but I’m reading from the Arduino every frame and I think the amount of data I’m sending through would exceed the limit of the fastest baud rate so instead, I’m sending a buffer of bytes with the arduino Serial.write() command. I tested with my Unity app only sending the ping and getting data on a key press and I found that the first two readings would always return junk data. Then after that, each reading would be one reading behind… that is if I change the voltage source from 0v to 5v and take a reading, it will return 0v. If I swing the voltage back to 0v and take another reading, it will return 5v. After another reading without changing the incoming voltage, it will correctly return 0v. It’s always accurate when sending via Serial.println() like in your tutorial, but I have this weird lag of one reading when using Serial.write(). Would love to know why because it would seem that I’m always going to be one reading behind this way! Thanks! Hey Alan, thanks for the tutorial! I learnt a few new things – especially Queue.Synchronized seems useful. I was missing one thing though: I think you should add that StopThread() should definitely be called at in OnDestroy(). Otherwise the thread will continue to run in the Unity editor even when you’ve stopped the app, and eventually Unity will crash. Is all that code in the Arduino thread? How would you periodically check the queue for data? Would you do that in that thread or a separate one? I’m getting an error on the line inputQueue.Queue(result); that says System.Queue does not contain a definition for ‘Queue’. Is it possible to see a full script with everything in that would read the data? Thanks so much, this blog is absolutely awesome and a massive life saver! Thank you for spotting that! The method is actually “Enqueue”, not “Queue”! I often refactor to make it simpler for the tutorial; that was a typo! Hopefully, I’ll be able to post the full script soon, but that is likely to be on Patreon! The best way is to only communicate when you need it. This depends on how fast you need to do it. Since is a thread, it will take some time to do the update. A good approach is to ask for a new data as soon as one becomes available. If you do it like that, you always have a single element in the queue. Ah fab! I’ll keep an eye out for when you release that, I’d definitely pay for it! So I’m trying to call the functions Write to Arduino and Read from Arduino from another script, but it says I either have to make them static or create an object instance. When I do either of those things it gives an error for the line stream.WriteLine(message); Object reference not set to instance of an object. (There’s definitely a message). What’s the best way to call the read and write functions outside of the thread? Thanks! Hang on I’ve realized I’ve accidentally been working in a separate class when I didn’t need to be -sorry!